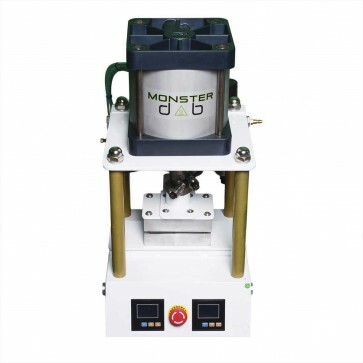 Using a Monster Dab Rosin Press is one of the most cost-effective and cleanest Methods to create your cannabis extracts. Completely solvent-less and non-volatile, the Monster Dab 5 Ton Pneumatic Rosin Press is more affordable than closed loop systems. This 5 Ton pneumatic press uses the power of a 5 ton (10,000 LB) hydraulic piston to press rosin concentrate from your herbal blends. It is a much healthier and safer option than using Butane and other volatile methods of extraction. Both heating plates are independently controlled for more flexibility. All you need is an air compressor with a minimum rating of 150 PSI (not included) for this pneumatic model, then set the appropriate temperature of both individual heating plates. Depending on your preference, Pressure can be adjusted using the pressure valve located on the back left of the press. This valve can be rotated clockwise to decrease or cut off all pressure, while turning the valve counter-clockwise will increase pressure and allow for the full 5-tons to be utilized. Depending on the type of product you wish to press, we recommend that you try different temperatures and time lengths to find the best settings for your product. We generally recommend using temperatures between 170-220 degrees Fahrenheit and 50 -90 seconds on the timer. As a general rule of thumb, Lower temperature plates will usually result in a higher flavor/terpene profile, but less yield. Your finished product is more stable (butter-like/honey consistency) and has a higher chance of maintaining the clear golden color that is so highly sought after. The higher temperatures of the plates will start to degrade the flavor/terpene profile in the finished product. However, higher temperatures tend to secrete more rosin from the plant material, thus resulting in a Higher yield, with your finished product being less stable (sap-like consistency). Another important variable to take into account is the Micron size of the nylon bag being used during the pressing process. The Higher the micron, (or "Micro Millimeter") the larger the holes in the nylon bag. 180 micron rosin bags will let some unwanted fats, lipids, and plant matter to escape the nylon bag. This will result in a higher yield and less-stable rosin. Where as the 45 micron bag with substantially smaller holes will result in a very high quality rosin with less of a yield.